The hybrid installation of alternative energy sources, including a wind generator and solar panels has been mounted at the cordon of the Lake Itkul in the nature reserve Khakasskiy. Mouning of the complete cycle of the system was started at the end of September and is going on in several stages, power generation started in November, which is necessary for satisfying the needs of the cordon, where 4 persons reside (the employees of the Security Department of the nature reserve). 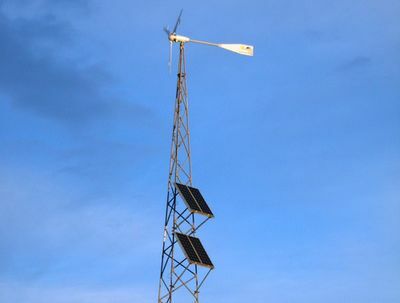 The hight of the mast, on which solar panels and the wind generator are installed is about 17 meters. The output capacity of the installation comprises up to 5 kW – this is enough for houdhold electrical appliances of the cordon and for the inhouse lights. The power produced by the wind generator and solar modules is saved in the accumulators for further use when there is no wind and solar activity. Despite the fact that the cordon has access to the grids of the centralized power supply, such an installation is an autonomous, reserve energy source for emergency situations. Besides, this is the first hybrid installation tested in the nature reserve, which produces energy using renewable energy sources – wind and solar light. And if this experience proves to be useful. Such installations will appear at other areas of Khakasskiy nature reserve, for example at Oglakhty – the optimal variants for getting electrical energy using renewable energy sources are being searched at the moment.